Stephen Benkovic’s recent work has focused on the assembly and kinetic characteristics of the protein machinery that is responsible for DNA replication by T4 phage and yeast; the importance of dynamic coupling of proximal and distal residues in the catalytic cycle of the dihydrofolate reductase enzyme that serves as a paradigm for describing enzymic catalysis in terms of a series of orchestrated protein conformations; the discovery of the purinosome through intracellular observation by fluorescent imaging of de novo purine biosynthesis, and the development of novel pharmacophores including cyclic peptides for modulating protein/protein interactions and benzoxyboroles as a new class of antibiotics and antifungal agents. Stephen J Benkovic received his BS degree in Chemistry and AB degree in English Literature from Lehigh University, and his PhD in Organic Chemistry from Cornell University. After a period as a postdoctoral research associate at the University of California, Santa Barbara, he joined the Chemistry Department at Penn State University in 1965 and became a Full Professor of Chemistry in 1970, followed by recognitions as an Evan Pugh Professor of Chemistry, and in 1988 the holder of the Eberly Chair in Chemistry. 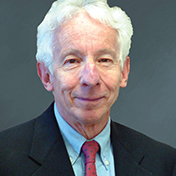 Benkovic’s work has been recognized by awards and fellowships including: Alfred P Sloan Fellowship, NIH Career Development Award, Guggenheim Fellowship, the Pfizer Award in Enzyme Chemistry, the Gowland Hopkins Award, the Repligen Award for Chemistry of Biological Processes, the Alfred Bader Award, the Chemical Pioneer Award from the American Institute of Chemists, the Christian B Afinsen Award, the Benjamin Franklin Medal in Life Science, the Ralph F Hirschmann Award in Peptide Chemistry, the National Medal of Science, and the National Academy of Science Award in Chemical Sciences. In addition, he has been elected to memberships in the American Academy of Arts and Sciences, the National Academy of Sciences, the Institute of Medicine, National Academy of Sciences, and the American Philosophical Society.